Twistification is a refreshing listen. Think The Strokes meets The Killers meets Mumford & Sons. 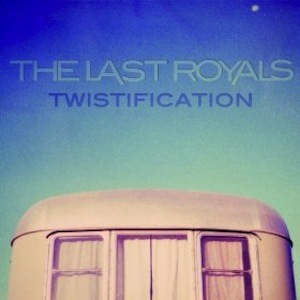 The sound is superbly balanced; rough yet catchy enough to allow The Last Royals to slip in and out of the mainstream with ease while maintaining a unique edge. Eric James’ voice is reminiscent of Brandon Flowers’ reverb-ed keen, but happily, James experiments with his range. His melancholy lyrics offset danceable techno inspired beats which successfully keep the gritty, slightly uncomfortable flavor consistent. Two of the highlights are the intro “Winter Waltz” and the last song “Barefoot Winter Waltz” both of which prick the ears with sharp grating glitches before James’ emotive voice croons dreamy lyrics that sooth the sting. 2013 prediction: it’s only a matter of time before they rocket to stardom.